One of my last buy on Amazon was this amazing book that reflects the last and crazy trend that is going on on the other side of the Alps: verrines (aka, little drinking glasses filled with savoury or sweet stuff). The book is wonderful, with so many ideas I can’t stop looking at it! Halve the avocados, scoop the flesh and mix it with the lemon juice, parsley and cumin. Once you have a thick cream add the diced tomato and pulse the mixer: the tomato must remain in chunks. Make a layer in each glass. Mix the salmon with the lemon juice and the dill. Do not over mix it, you need chunks even in this. Make a layer over the avocado cream. Bring to the boil a pan with 3 litres of salted water. 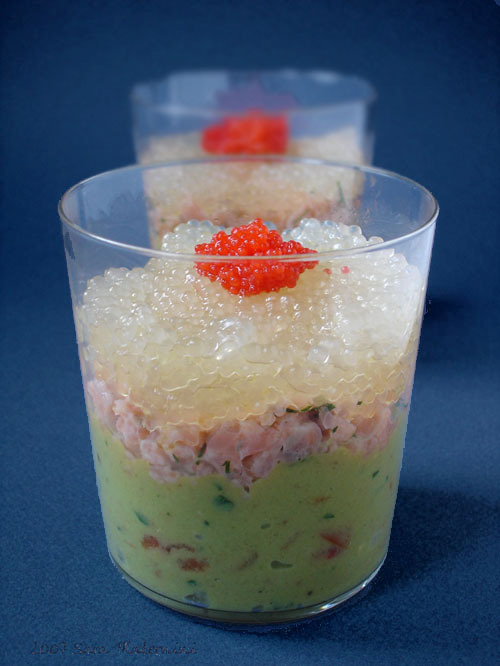 Add tapioca and cook for 15 minutes or until the tapioca is tender. Drain and cool it under cold water. Dress with a tablespoon of olive oil. Make the last layer over the salmon. 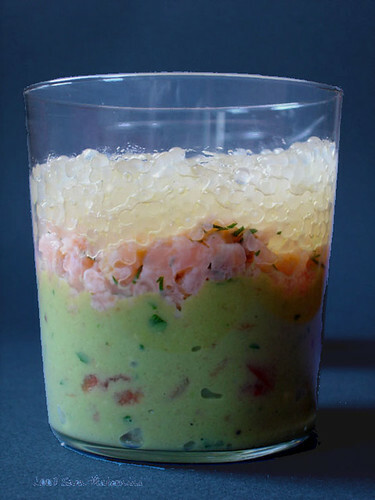 Decorate with fish eggs or dill. I know i vowed off any new recipe books at the start of 07, but this one really appeals. Please tell me there is no English version so that I have an excuse not to get myself into trouble by purchasing it…? How was the tapioca??? I’m interested in how the texture interacted with the rest of the dish. Sam: The book I think is only in French, never seen an english version… I can tell you it’s worth it! now then I really have to learn french?? !